Pacman Frogs have interesting characteristics. They spend most of their time in one position, laying in wait for food. This make them seem lazy but it's an adaptation for catching prey and it works very well. These frogs are about as wide as they are long. They can reach 6 inches (15 cm), and they have a mouth that reaches almost all the way across their face, hene the nickname "pacman". The general appearance is spotted and blotches, and they come in a variety of colors. You will find them in green, brown, and albino, but there are less common colors such as gray, blue, shades of red and more besides. Pacman frogs are all members of the genus Ceratophrys. Currently, there are 8 species in the genus Ceratophrys. The two species most likely to be encountered in the pet trade are C. cranwelli (the Chacoan Horned Frog or sometimes referred to as Cranwell's Horned Frog) and C. ornata (the Argentine Horned Frog). There are other Pacman species available, but those two are the most popular. Other Pacman frog species include C. aurita (Brazilian Horned Frog), C. calcarata (Venezuelan Horned Frog), C. cornuta (Surinam Horned Frog), C. joazeirensis (Caatinga Horned Frog), C. stolzmanni (Pacific Horned Frog), and C. testudo. Fantasy Pacman Frogs, sometimes referred to as just Fantasy Frogs, are infertile hybrids of C. cranwelli and C. cornuta. They have pointier horns than C. cranwelli, but are not as strikingly shaped as C. cornuta. Pacman frogs have a few basic housing requirements. Despite their lack of activity, they can reach a large size, so they should be housed appropriately. A 10 gallon tank (40 Litres) is the minimum for an adult horned frog, but a 20 gallon "long" tank is the preferable. This larger size terrarium is as much as a pacman needs, because they won't make use of more room, provided the terrarium contents are well-thought out. Pacman frogs should never be housed with other Pacman frogs, or any other reptile or amphibian. They will eat anything that will fit in their mouths, and may even try to eat things that will not fit in their mouths. A substrate is needed to keep your frog happy and feeling secure. Pacman frogs love to burrow to help regulate their body temperature and to lay in ambush for potential prey. They should not be kept on substrate that stays "soaked" at all times. Moist but not wet is a good guideline. Watering only one end of the tank will give the frog a choice of moisture levels. They should also be kept on substrate that they will not choke on, or become impacted if they swallow too much while eating. 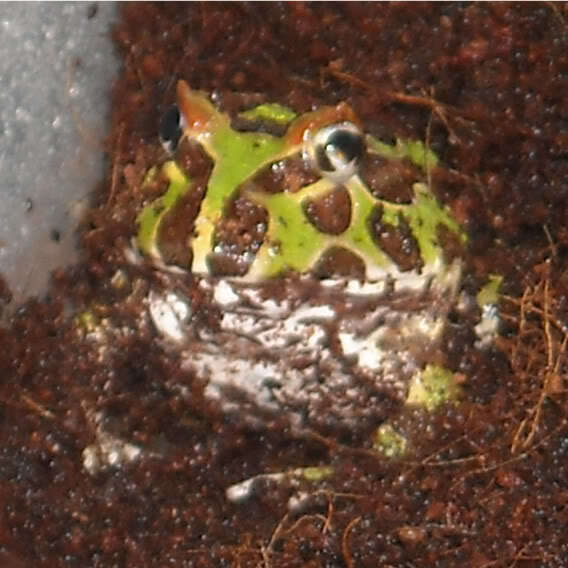 Substrates like bark and gravel can be harmful if swallowed and do not allow pacman frogs to burrow well. One of the best substrates available is ground coconut fiber. This is sometimes known as coir and is often available under the brandname "Eco Earth". Don't confuse it with coconut husk or coconut chips. Pacman frogs can pass coconut fiber if they swallow it during feeding. This substrate has the added advantage of helping to regulate humidity. It's also ideal for burrowing pacman frogs, as long as it is misted regularly. Another often recomended substrate is top soil. Top soil from your garden may contain garden chemicals, pesticides, or parasites which can harm your pacman frog. However, you can buy a safer alternative from a garden center of hardware store, but make sure it is not treated with fertilizers or other chemicals. The substrate should be at least 2-3 inches (5-7.5 cm) in most cases so that the frog can burrow deep enough for its security and comfort. Also, it is a good idea to provide Pacman frogs with extra cover. The easiest is to add some fake terrarium plants, or add an amphibian-safe cave bought from a pet store. Hollowed-out half logs are also very suitable. Cover is essential for your Pacman frog, and providing it makes your frog feel more secure. A thermometer is a necessity for monitoring the terrarium's temperature. 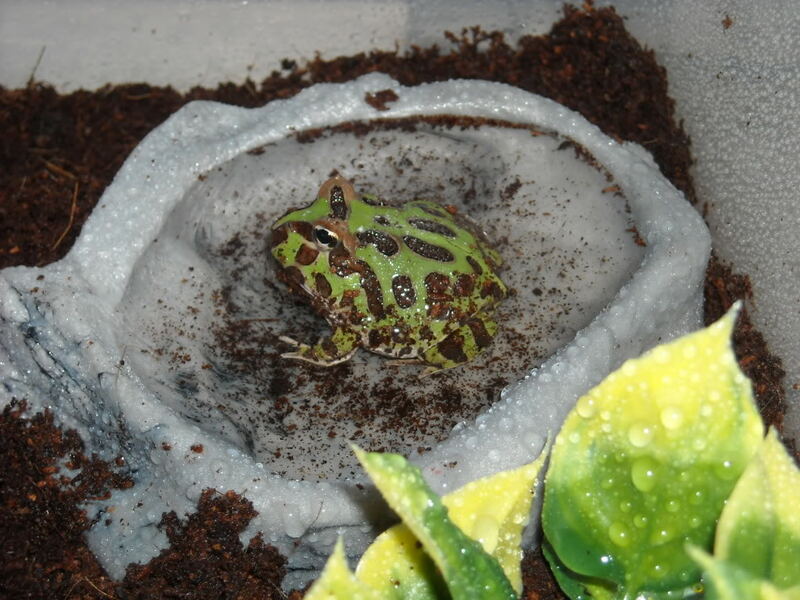 Your Pacman frog's terrarium temperature may be warmer than that of your home due to heat trapped by the terrarium lid. Pacman frogs prefer their encloser to be in the range of 80-85 °F (27-30 °C) during the daytime and 75-80 °F (24-27 °C) at night. A tank heater can help you keep the temperature in the ideal range. Suitable heating methods include a UTH (Under Tank Heater / heat mat), or a heat lamp. If you use a UTH, in many cases it's best not to place it under your pacman's enclosure. Pacman frogs will instictively burrow to cool down. Obviously, having the heat source below the substrate could result in the pacman frog warming up when it wants to cool down. You can place the UTH or heat mat on the side of the terrarium to avoid this problem (place it on the outside, not the inside). You will need a Hygrometer to measure humidity. Pacman frogs prefer a humidity of at least 60% but 80% is better. They will occasionally shed their skin (they will eat it, so you probably will not see them do it), and if the humidity is not correct, they may have a very hard time getting their shed off. Humidity at about 90% may also produce mold, though the mold will generally only last a week or two. You can modify humidity by purchasing a mister (that has had no chemicals in it) and misting the enclosure daily. To lower humidity, mist less frequently and/or get a smaller water dish. For misting, it's best to use distilled water or reverse osmosis (R/O) water because these do not contain minerals that can leave cloudy deposits on your glass over time. You may also need water treatment. Your tap water contains chlorine and possibly chlorimines. These substances can harm or even kill your frog. You will need a water treatment product. Those sold for as aquarium water conditioners or dechlorinators are ideal. You will need to treat every drop of tap water before using it in your frog terrarium. A water dish is very important for your Pacman frog. Unlike many frogs, Pacman frogs are not good swimmers. You will need to provide them with a shallow water dish so that they don't drown. If they can sit comfortably in it with their head out of the water then it is fine. They are not good climbers, so the water dish should allow easy entry and exit. If it is slightly too tall, you can make a small ramp of substrate, or bury the dish a little bit deeper into the substrate. The water dish will need to be changed frequently, depending on how often your frog uses the water dish. Some pacman frogs will almost live in the water dish. Some don't use it often at all. You should change your the water in the dish at least once a week, but if your frog uses it often, you may need to change it more frequently. Horned frogs will eat almost anything that will fit into their mouths. You need to be careful about the selection of food you provide. Pacman frogs have Odontodes that act like teeth. If they bite something that is too big, it is difficult for them to spit it out because the Odontodes are designed to keep prey from escaping the mouth. One important piece of advice about your frog's diet is to never feed them anything wild-caught, or caught outside. 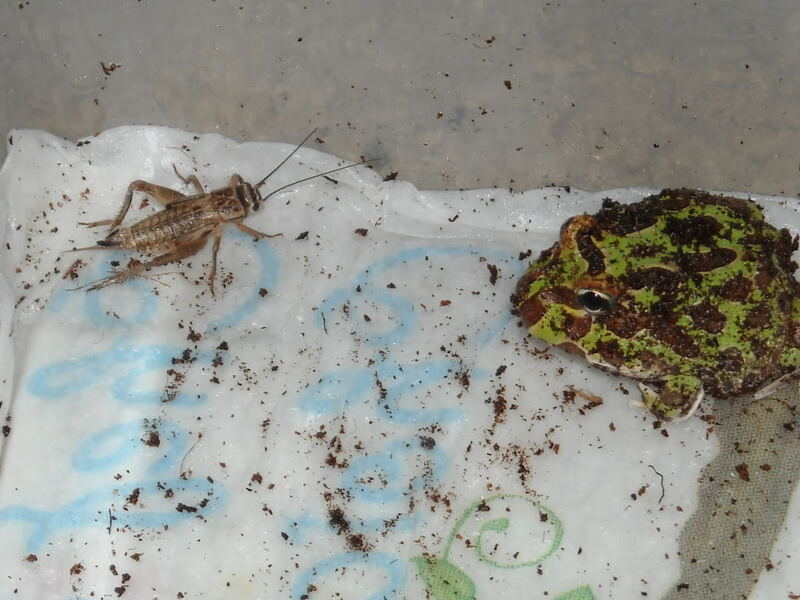 Wild-caught crickets often contain parasites and pesticides that could harm, and in some cases kill a Pacman frog. Crickets make a good staple diet for Pacman frogs. By staple we mean what is fed most often. There are alternative staples such as captive-cultured cockroaches, but crickets are easier to find (at the pet stores), and they are arguably easier to breed and more readily accepted. Crickets, however, are not very nutritionally beneficial in and of themselves. Therefore they should be "gut-loaded" before being fed to your frog. "Gut-loaded" simply means that you feed your crickets nutritious veggies like carrots and potatos before feeding them to you the frog. There are very good commercial gut-loading diets available in pet stores that are often easier/less messy alternatives to making your own mix of vegetables and grains. You aren't going to get your Pacman frog to eat a carrot because Pacman frogs like moving prey, and the frogs can't break down pure vegetable matter, so "gut-loading" the crickets is the best way to provide the required nutrients to the frog. Adult Pacman frogs can be fed crickets 2-3 times a week, and youngsters should be fed 5-7 times each week. Your Pacman frog will also need a calcium dusting supplement to help their bones develop. Unlike reptiles they do not require vitamin-D3 supplements, but there is no harm in using a calcium+D3 supplement. To dust the crickets, one approach is to put the crickets you intend to feed in a plastic bag, add some dusting powder, and shake the bag until the crickets are lightly covered in the supplement. Avoid placing the powder directly on your Pacman frog, as this can cause distress. Frogs absorb water, oxygen, and even chemicals through their skin. A vitamin supplement is also a good idea for healthy growth. Vitamins usually come in powder form, just like the calcium supplement, but they are sold separately because mixing calcium with a vitamin supplement can reduce the shelf life of the vitamins. It's not a good idea to feed the calcium supplement at the same time as the vitamin supplement because the frog's digestive tract may not absorb the two types as well as it would if they were fed separately on two different occasions - it is not helpful or necessary to dust every feeding. Supplements should be used more regularly for younger frogs because they grow at a higher rate than older frogs. Aside from the staple diet, Pacman frogs should be fed a variety of foods. These frogs ambush their prey, and they only respond to prey that moves. Keeping that in mind, you can feed them a selection of live foods. Nightcrawlers/Earthworms, often sold as fish bait, are fine as long as the worms are alive. Make sure that the bait is not scented and that it has no additional chemicals or additives. Earthworms are also suitable as a staple food. Their nutritional value is virtually complete for amphibians and they don't require gut-loading. Fish can be an important part of a Pacman frog's diet, but only if certain conditions are met. Goldfish should be avoided because of their high fat and calcium levels. Feeder fish often carry parasites, and some fish diseases can be passed on to amphibians. We generally recommend that you avoid buying "feeder fish" at the store to avoid these problems. You are better off breeding your own. Livebearing fish, such as guppies, that can make great food for your Pacman frog, but they should only be used as a treat food and not a staple. Captive-bred mice can be included in your Pacman's diet, but only as a rare treat due to their high fat content. Frozen mice can be bought prepackaged at most pet stores. It's generally better to feed pinky mice than larger mice - smaller mice are more easily digested. A pinky mouse is a newborn mouse that has no fur, and whose eyes have yet to open. As the frog grows, you can slowly begin to use larger sizes of mouse. Avoid feeding Pacman frogs fully alert mice after the fuzzy stage. Alert mice that can see may bite and possibly injure your frog. Many people want to hold and pet a frogs. Amphibians are generally "look but don't touch" pets. Pacman frogs may bite fingers and this can be painful due to their tooth-like projections. Only handle your frog when absolutely necessary (e.g. moving the frog from tank to tank). There are two things that must be considered before handling Pacman frogs. The first is that they do not like to be handled. Pacman frogs have a reputation for being aggressive, but this is usually because people overhandle or frighten them. You must be cautious not to get bitten. People often react to the surprise of a bite by throwing the frog across the room on impulse, so you must be prepared for the chance that you could get bitten and not accidentally harm the frog. Another factor to consider is that all frogs absorb chemicals through there skin. You have oils on your hands, you may have chemical residues (such as soap) and these can be harmful to your frog. It is a good idea to wash your hands thoroughly and be sure all soap residue is rinsed off. 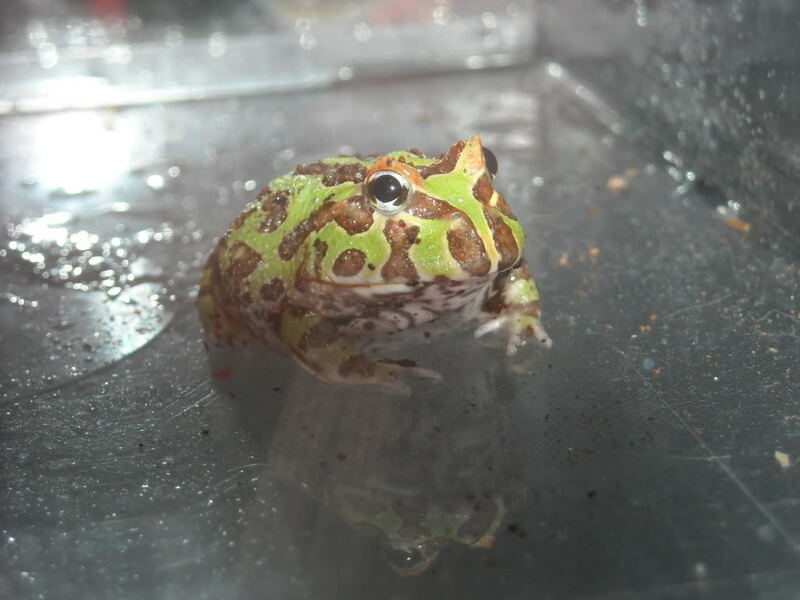 Pacman frogs are a challenge to breed. They are aggressive, and a large frog can eat a smaller frog, so breeding must be done carefully. Under breeding conditions, the pair(s) are not likely to hurt each other, provided they have been well fed. Obviously you need a male and a female. Mature males are smaller than mature females, males will croak, and females are silent. Putting 2 Pacman frogs together that are not the correct gender could result in an injured or dead frog. To prepare the frogs for breeding, you must condition and "cycle" them. Conditioning involves feeding the frogs well, which you should be doing any how, for a few months. To cycle, start preparing the frogs for a dry and cool period. In the wild, these frogs start this period some time in the late winter. At home, the temperatures you provide will trigger instictive behavior, just like the weather in the wild. You should aim for a temperature between 55 and 60 °F (13-15 °C). You may be able to complete a successful breeding at a different time of year, but it is easiest and most reliable to use the weather outside to your advantage (e.g. it may be diffecult to keep temperatures below 70 °F (20 °C) in the summer). Light duration (photoperiod) decreases in the winter, and this is also easier to simulate when the conditions are naturally in tune with what you're trying to achieve. To cycle the frogs, place them in a container or tank with a deep layer of sphagnum moss. Provide a lid for the container so the frogs can't escape (it is unlikely they will try to escape but do take precautions). A lid will also help to stabilize the level of humidity, which should be distinctly lower than their normal terrarium. The frogs will burrow into the substrate, and should not emerge until the next step of breeding in 2-4 months. While the Pacmans are dormant, once per week very lightly mist the moss and then replace the lid. After waiting at least 2 months, it is time for the next step. Raise the temperature back to the day time conditions and mist the container(s) very heavily. They should emerge within a day or so - if not, remove them yourself. You can now feed your frogs their first meal. It is a good idea to feed them separately, so that they aren't likely to hurt each other. After they have eaten, they are ready to be placed in the breeding tank. The water should be very shallow with places to haul out, so that the frogs are in no risk of drowning. It is recomended that you place an aquatic plant in the enviroment for the female to lay her eggs on. It also helps with water quality. Usually within four days, the female(s) will lay eggs. After the eggs are laid, the male and female can be moved back into their separate tanks, and should be cared for under normal conditions. The eggs should hatch in about 1-2 days. After the tadpoles emerge, you have 2 options. These tadpoles are meat eaters and quite cannibalistic. The first option is to separate all of the tadpoles into their own jars. This can be very time consuming, especially if you intend to raise them all (there may be several hundred). The second option is to place groups of tadpoles into large aquariums with lots of aquatic plants. When fed, they will swim for the food and then hide again. Please note that if you are not familiar with aquatic plants, you need to do your research on them. Pet stores like Petco and Petsmart in the US sometimes sell plants that aren't even aquatic in the aquarium section of the store. Many plants will not survive in low-light conditions, so do your research. Some suitable plants include Anacharis, Elodea, and Hygrophila. You will certainly lose some tadpoles to cannibalism if kept in groups, but it is more feasible, and if they fed regularly and well, losses to cannibalism should be minimal. Water should be changed very regularly (every day or two). Please note that if you leave tadpoles in a jar without changing the water, they are likely to die quickly. Tadpoles should be maintained at a temperature of 75-80 °F (24-27 °C). This can be accomplished using an aquarium heater. The tadpoles will grow very quickly. In less than a month you will have your first froglets. All frogs drown easily around the time their front legs emerge, so they should be provided with very shallow water and there should be ramps, objects, islands, etc, on to which they can climb easily. You must make another difficult desicion at this point: if you leave the growing froglets in a large tank, you will invariably see cannibalism. You could allow this, or you can switch to the hard work of keeping the frogs in individual cups. These will require changing every day to avoid fouling and possible disease. This can be a time-consuming process, but very much worth it for the experience. You may even make somewhat of a profit, if you have a willing pet store(s) near you or you sell the froglets over the Internet. this is great! Thanks so much, I've been looking into getting a pacman and this sheet was perfect timing! Thank you for posting this care sheet, it was extremely informative and helpful! "People often react to the surprise of a bite by throwing the frog across the room on impulse, so you must be prepared for the chance that you could get bitten and not accidentally harm the frog." Can you try to explain what being bitten by a pacman frog feels like that people react that way? I have snakes and have been bitten and have never reacted that strongly, especially when you go in knowing there's always a chance you could be bitten. Wood Frog Care Sheet ??????? ?